A fast-growing share price and rich P/E ratio might keep some investors away, but here are a few reasons to reconsider the leader in online travel. The Priceline Group's (NASDAQ:BKNG) stock has climbed relentlessly over the last decade as travelers increasingly rely on booking accommodations and travel plans online. If you look at the company and regret missing that boat, take solace: There could be more room for the company to run. Here are three reasons the upward trend could continue. The industry the Priceline family of companies competes in is huge -- $1.3 trillion, to be more specific, according to company estimates given during the investor presentation last fall. When considering that the global travel industry is highly fragmented across many businesses, that gives the online travel leader ample room to keep growing. The company has gone on the attack to consolidate some of that global business by using different names to capture different areas. For example, Agoda.com has led the charge in building the Asian travel business; Open Table was purchased a few years back to go after the restaurant industry; and Booking.com specializes in getting alternative rental accommodations like homes, condos, and private rooms to the online market. 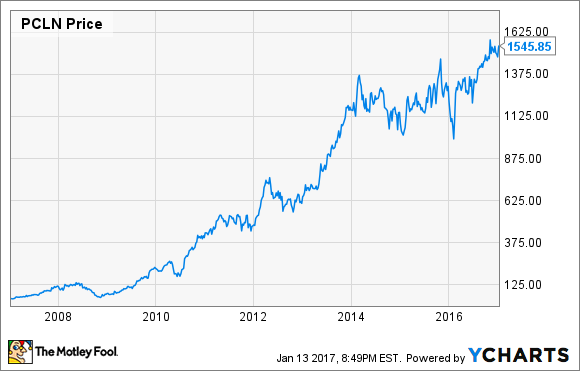 Priceline has grown very quickly, going from a small player barely topping $1 billion in revenue a decade ago to $9.2 billion during its last full fiscal year. However, that figure would put the company at accounting for less than a percent of the global travel industry, plenty of space for further expansion. Also on the last investor presentation was management's specific highlight of the online accommodation business. At last tally at the end of 2015, online booking of room rentals reached values of $228 billion globally. While that is a big number, it pales in size when compared to the $648 billion hotel accommodations booked during the same year. That means travelers making reservations online only accounted for only 35% of all business. Image source: The Priceline Group. Data source: Euromonitor. The growth in number of travelers using the internet to book a stay has been great, up from only 12% back in 2015. But the shift has continued to favor online, with rooms booked digitally averaging a 3% increase each in the last four years. Given that younger generations have never known the world without a connected device, that trend will likely remain intact. Part of the Priceline Group's growth strategy has been adding brands with international appeal. That has led to the family of companies being able to operate in 225 countries and territories around the globe, with a majority of its staff working on supplying travel accommodations and customer service. The company has worked hard to leave no stone left unturned. For example, the biggest money-maker in Booking.com is available in 42 different languages, capturing a wide swath of the world population (the top 10 languages by number of native speakers covers nearly half the world population). The site also boasts over one million property listings, a milestone it reached last summer. Image source: The Priceline Group. Using its large scale and synergies across multiple travel offerings that span travel ticket, room, car, and meal reservations, the company has been able to keep its global footprint on the up and up. The top and bottom lines have continued to grow in the double-digits, even after the company's multiyear string of higher highs. During the last reported quarter, revenue rose 23% year over year. Excluding a one-time impairment charge from its Open Table purchase, profit rose another 21% last quarter. With growth rates like that, it's hard to feel pessimistic about the business, even if the stock carries a high-flying 39 price-to-earnings ratio. With plenty of room to grow in the digital travel industry, Priceline could still be worth considering.